Kyle Orton is clearly the best quarterback on the squad right now, but that doesn't mean he isn't still immensely average at best. He had some tremendous throws tonight, yet also managed one of the worst interceptions you'll ever see and reminded me yet again why hope dies for the Broncos offense once the play breaks down. Once Kyle Orton feels the pressure, he becomes hopeless in the backfield. He just runs backwards until someone can corral him for a huge loss. The man is fundamentally incapable of making something out of nothing. Von Miller is impressive. A 2nd overall pick better be impressive, and Von's speed around the corner is breathtaking. I haven't seen enough of him to know if he'll be consistent and able to make it through a full season of NFL pounding, but I've been impressed in the little I have seen. Tim Tebow remains raw. I have no idea if he'll ever mature into an effective NFL player, but it's clear he's not there yet. Despite the fact that he is the highest profile player on the Broncos by a mile, fact is, he's probably the third best quarterback on the roster, and may never get good enough to be a starter. I continue to hope for the best, and expect the worst. 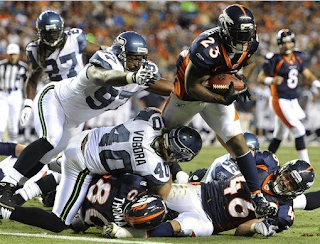 Knowshon Moreno shows flashes of brilliance, and then continues to be an average back. If you're a fantasy player picking him up for your team, be wary that it appears there is an excellent chance that Willis McGahee is going to vulture a lot of his touchdowns, as it sure looks like John Fox likes using Willis in goal line situations more than Knowshon. Tavaris Jackson is still Tavaris Jackson, meaning I'm not expecting much from Seattle this year. John Fox looks like the kind of guy who yells at kids to get off his lawn. I get a very Parcells-ish vibe from him. I don't necessarily consider that a good thing. I can't shake the feeling that the Broncos should be improved from last season. Not that they're going to be good, but merely improved. After 4-12 last year, Improvement is all I'm really hoping for. I got into a conversation with my brother about what a pie-in-the-sky best possible season might be, and we both agreed 8-8. Safe to say that it's not the best time to be a Broncos fan, but we remain faithful. Who knows, maybe I'll be pleasantly surprised with a fun season. You gotta be hopeful in August. Anyway, that's enough about the fake football of August. Wake me up when September comes and the games actually count. Go Broncos!